At the annual Boro x Boro meetings NY4P convenes community groups, open space advocates, and other people passionate about parks. 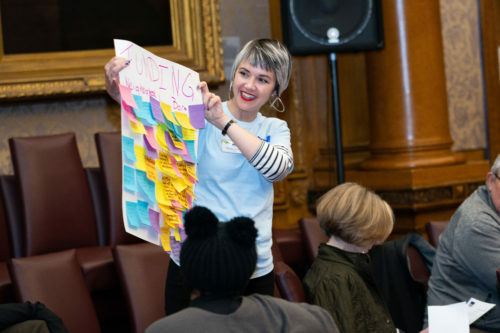 In 2018, each borough meeting focused on turning ideas about improving our parks into action steps we can all feasibly attain, and ended with time for networking and getting to know fellow neighborhood park advocates. We got to know each other, shared lessons learned, and identified opportunities to combine our efforts for maximum impact. Each Boro x Boro meeting series culminates in our citywide meeting, which brings the five boroughs together to reflect on our action steps and identify the roles our local elected officials can play in assisting us. 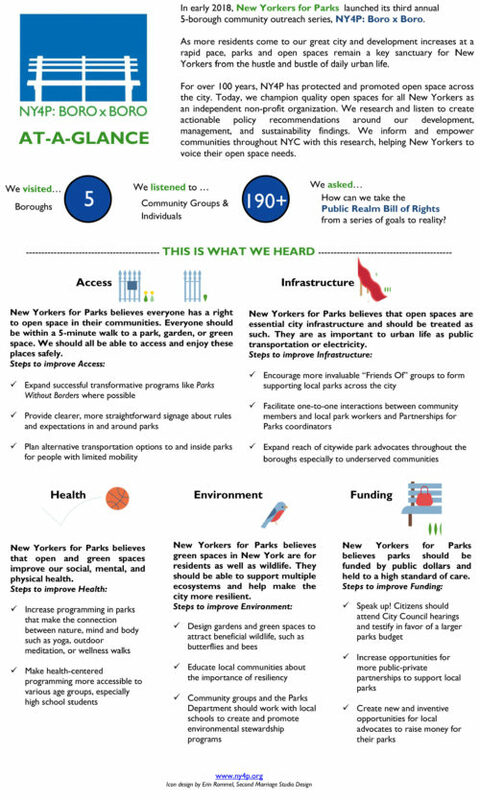 Our Boro X Boro At-A-Glance one page report shows the key takeaways from our NY4P: Boro x Boro meetings with over 190 community groups and individuals representing all corners of the city, articulating a vision of what’s important to New York park advocates. One concern came up in every location, and it underpins the success of many of the goals laid out by advocates: lack of adequate funding for parks maintenance and operations. If you see your concerns about your local open spaces reflected in these findings, you can reference it when speaking with your elected officials as evidence that your issue isn’t affecting only your park – it’s a concern across the city. For example, if your community needs more health programming in your local park, you can show your elected officials that communities across the city want the same thing. It’s easier to make the case for increased funding when you have evidence that it can benefit the entire city.